Can I justify buying a charter yacht? Are you one of the many sailors who love the idea of owning a boat but can’t justify the expense? If you are in the fortunate position where you could be on the water more than a couple of weeks a year then buying a charter yacht may well be right for you. Money. You’ll need to put all the details into excel and work out where else you could invest your money too, but as a rough guide if you want to use a boat for more than 4 weeks a year then buying a charter boat makes sense. Often the deciding factor is whether you need to pay for finance for the boat. Use of yacht. It’s a bit like having a second home. When you don’t have one, week-ends away are few and far between because they have to be organised and there is an extra cost involved. When you already have a second home you find yourself using it every time you have a spare week-end and inviting friends. Decisions over where to go on holiday suddenly become a lot simpler and you may find you’re on the water a lot more than you think you will be. Option to co-own the boat with another couple or family. This adds in a little complexity but plenty of people follow this model simply because it means there is less financial commitment. All you need to do is make sure you have a comprehensive written agreement between all the parties so you already know what will happen if someone wants to sell their share or pull out of the charter arrangement. No need to re-familiarize yourself with a different yacht every holiday. There’s something very comforting knowing the boat you will be chartering. No wasted time working out how to use the navigational equipment, store the dinghy and kayaks etc. The yacht will be kept in good condition. Any reputable yacht charter company will keep their yachts in good condition. No more boat cleaning. Cleaning a boat is never the best way to end a fantastic holiday. If your boat is in a charter management program you simply step off the boat with your bags and think about where you’re going to have lunch! A great outdoor activity for children of all ages. 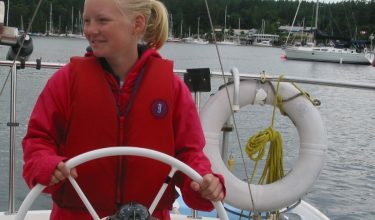 Sailing adventures are a wonderful way to build confidence in a child. The more often you can get your children on the water the better. The alternative. OK, if the above reasons aren’t enough then you’re moving from persuasion to bribery…..you could spend the money on a depreciating item, such as a car?! A terrible idea. What’s the best boat to buy for charter? Type of charter company. If you like the idea of one of the large charter companies, such as Moorings, then you will have to buy one of their boats. If you select a smaller charter operation there is likely to be more flexibility. Post charter plans. If you’re buying a boat that you’re planning to have forever it is quite a different objective from buying a boat to sell in 5 years time. Just be clear on your objectives. Think of your target market. Think about what you look for when you charter a boat and you won’t go too far wrong. Have a read of the Nanaimo Charter Management Programme where we have listed out what makes a boat desirable for charter. Whether you can justify buying a charter yacht is a personal decision. Having a yacht is wonderful, but there is a cost and commitment involved. At Nanaimo our door is open for you to ask any questions and answer any of your concerns.